Come out and support a GREAT cause – join us at one of our annual events! This 4-man scramble is an annual event hosted at Aberdeen Golf Club in Eureka, MO. There are opportunities for sponsorship, prizes, food, entertainment, and fun! The Annual Scholarship Awards is our opportunity to announce new scholars for the year and honor past scholars. In 2014, we will host the first annual Ava’s Grace 5K & Drag Race Event. 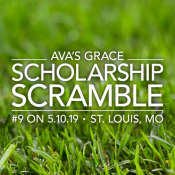 Each year, Ava’s Grace scholars and board members get together for a day of giving back.